For landowners, donating a conservation easement is a way to protect places they love. It’s also a major financial decision. When landowners donate a conservation easement, they give up part of the value of their property — often their family’s biggest asset. Tax incentives offset some of that loss in property value, making conservation a viable option for more landowners. Landowners and land trusts should be aware that the improper use of federal income tax deductions for both land and conservation easement donations can involve potentially abusive tax shelters. To help land trusts identify and avoid any questionable transactions, we have assembled multiple resources for reference and guidance. In 2015 Congress enacted one of the most powerful conservation measures in decades: the enhanced federal tax incentive for conservation easement donations. If you own land with important natural, agricultural or historic resources, donating a conservation easement can be a prudent way to both save the land you love forever and to realize significant federal tax savings. Two additional resources: View the exact language that Congress passed and learn how it has changed existing statutory law and read a memo from the Internal Revenue Service offering guidance regarding deductions by individuals for qualified conservation contributions. A conservation easement, also called a conservation agreement, is a voluntary and legally binding agreement between a landowner and a land trust or government agency. When a landowner donates an easement to a land trust or public agency, she or he is giving away some of the rights associated with the land. The easement permanently limits uses of the donated parcel in order to protect its conservation values, as specified in the Internal Revenue Code (IRC) 170(h). Conservation easements offer private landowners flexibility in protecting their land. For example, a donating landowner can retain the right to grow crops on a parcel while, at the same time, relinquishing the right to build additional structures on the parcel. The land trust is responsible for making sure that a landowner adheres to the conservation terms of the easement. An easement may apply to all or a portion of the property and may or may not allow for public access to the property. A landowner who has donated a conservation easement can sell the land or pass it on to heirs, and future owners of the property are bound by the terms of the easement. How does the permanent, enhanced tax incentive work? If a conservation easement is voluntarily donated to a land trust or government agency, and if it benefits the public by permanently protecting important conservation resources, it can qualify as a charitable tax deduction on the donor’s federal income tax return. Easements vary greatly in value. In general, the highest easement values are found on tracts of open space under high development pressure. In some jurisdictions, placing an easement on one’s land may also result in property tax savings for the landowner. What is an example of the financial benefit that the permanent tax incentive provides a landowner? Prior to 2015, a landowner earning $50,000 a year who donated a $1 million conservation easement could take a $15,000 deduction (30% of his or her income) for the year of the donation and for an additional five years, generating a total of $90,000 in tax deductions. The new, permanent incentive allows that landowner to deduct $25,000 (50% of income) for the year of the donation and for each of an additional 15 years. This would result in a total of $400,000 in deductions. If the landowner is a farmer or rancher, he or she can deduct $50,000 (100% of income) in the first year and then for each of the following 15 years, realizing a maximum of $800,000 in deductions. Can anyone deduct more than the value of his or her gift of an easement? One can never deduct more than the fair market value of the gift. 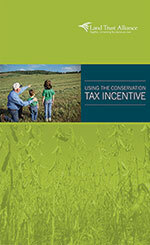 The permanent incentive simply allows landowners to deduct more of that fair market value. Who qualifies as a farmer or rancher? The planting, cultivating, caring for or cutting of trees, or the preparation (other than milling) of trees for market. For an easement to qualify for a farmer or rancher, it must contain a restriction requiring that the land remain “available for agriculture.” This provision also applies to farmers who are organized as C corporations. Additionally, Alaska Native Corporations are eligible as farmers or ranchers. Do these changes apply to gifts of land? The expanded incentive does not apply to gifts of land in fee. It only applies to gifts that qualify under IRC 170(h)(2), such as conservation easements. A landowner considering the donation of land should consult an attorney to determine whether the structure of his or her gift should be changed to take advantage of the permanent incentive. When does the permanent incentive apply? The permanent incentive applies to all conservation easements donated after December 31, 2014. Conservation easement donations must comply with “conservation purposes” as defined in IRC 170(h). A donated easement must be a true gift. It must protect significant natural, agricultural or historic resources that public agencies or land trusts want to have conserved. A donated easement cannot serve to simply prevent development on a property or be part of a “quid pro quo” agreement in exchange for a government action, such as issuance of a building permit or a zoning change. Will donors who use this provision be audited by the IRS? Taking advantage of the 2015 law should not affect one’s likelihood of being audited. However, all donors should note that the IRS does pay attention to donations of property that are high in value, including donations of conservation easements. This makes it important for donors and their advisors to know and follow the law, utilize a reputable professional appraiser who has experience in the appraisal of conservation easements and donate to a well-established, reputable land trust that has adopted and implemented Land Trust Standards and Practices. What is the role of the land trust? Potential easement donors should know that donating a permanent conservation easement is a big commitment requiring careful consideration and independent legal advice. Donating a conservation easement requires a working partnership with a land trust — and time for careful drafting of documents and maps, baseline documentation and a professional appraisal. Landowners should understand that a land trust may decline to accept a donation that does not meet both the legal requirements and the land trust’s own specific charitable mission and strategic plan. In addition, land trusts will want to see the appraisal before accepting your gift. How do other laws affect easement donations? The 2006 law also tightened the rules for easements on “certified historic structures.” If you are protecting a property that includes such a structure, new regulations, including a filing fee and specific appraisal requirements may apply to you. In addition to the federal tax deduction, 16 states offer some form of tax credit for conservation easement donations. Many state incentives apply to fee-simple donation of land as well as conservation easements. The most powerful state tax incentives for conservation are the transferable tax credits available in Colorado, Georgia, New Mexico, South Carolina and Virginia. In these states, if a landowner donates an easement but doesn’t owe enough tax to use the full credit, he or she can sell the remaining credit to another taxpayer, generating immediate income. Nine states offer some form of non-transferable income tax credit — Arkansas, California, Connecticut, Delaware, Iowa, Maryland, Massachusetts, Mississippi and New York. The New York tax credit is unique, offered not at the time of donation, but every year in an amount equivalent to 25% of the property taxes paid on land under easement. Two years after succeeding after succeeding in getting the enhanced tax incentive for conservation easement donations passed with the help of many partners, the Land Trust Alliance features stories from land trusts and landowners showing how it’s working. With the newly permanent easement tax incentive and nearly 75 court decisions dealing with easements since 2008, you can now stay current on tax law with our newly-updated Tax Guide to Conservation Easements.